Clearing storage space is a constant concern for people with iPhones, especially since they don't come with expandable storage, limit the amount of free iCloud storage, and still, unfathomably, produce units with only 16 GB of space. Thankfully, Reddit user eavesdroppingyou shared this quick and easy tip you can use to wipe unnecessary files from your phone and potentially free up gigabytes worth of storage. You can see the trick in action in this video from YouTuber iTwe4kz. And don't let the "one weird trick" garbage in the title sway you—we tested this method and it works. Really, really well. 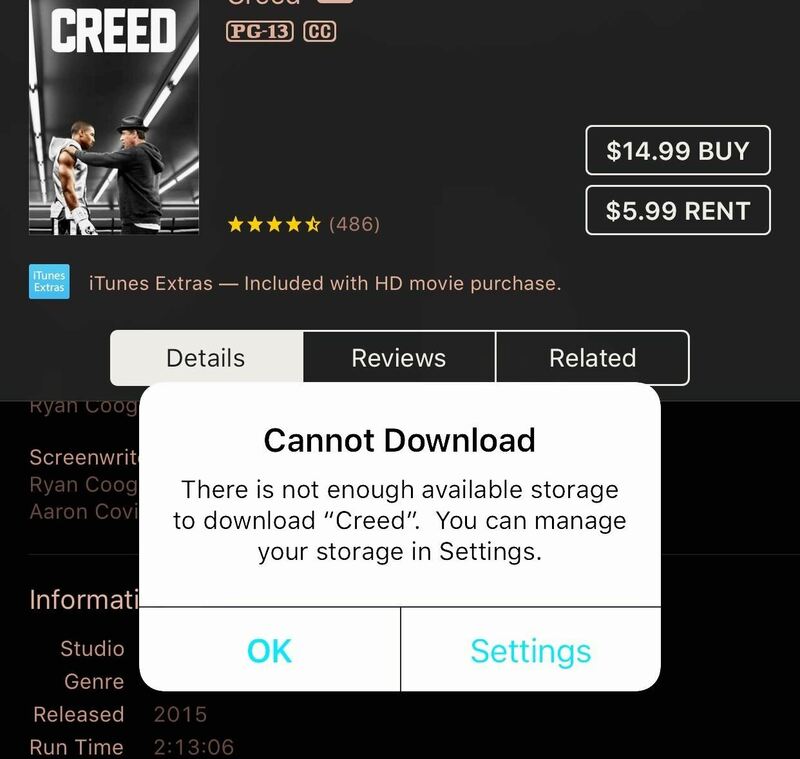 All you have to do is open the iTunes Store and attempt to Rent a movie that has a larger file size than the amount of storage you have available on your phone. You'll be shown an error message saying that there isn't enough space available to download the movie, and that you can manage your storage by entering the device's Settings. However, all you have to do is click on Settings or OK, and your iPhone will automatically remove some useless files, instantly giving you more space. You'll have to repeat this process a few times, but we ended freeing 3 GB of storage. Let's go through the full procedure. 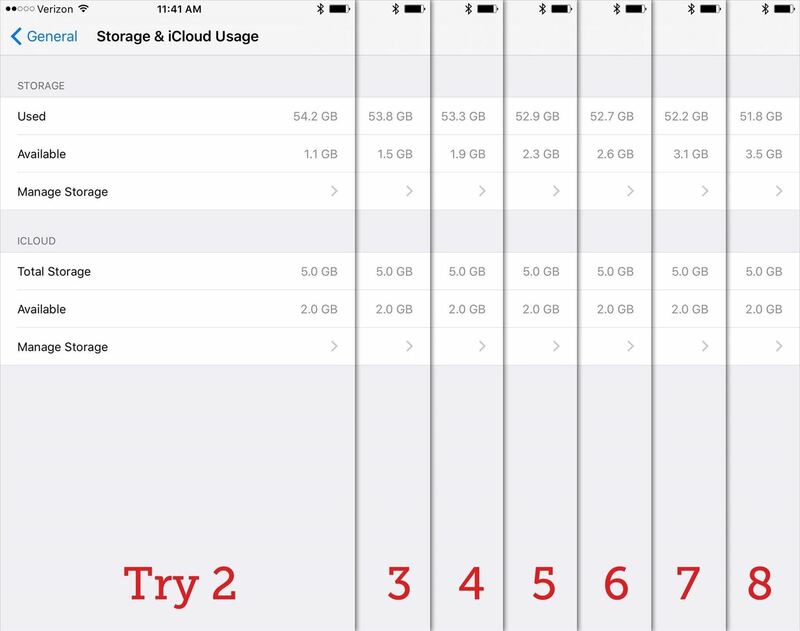 We started with an iPhone 6 Plus that only had 479 MB of internal storage available. 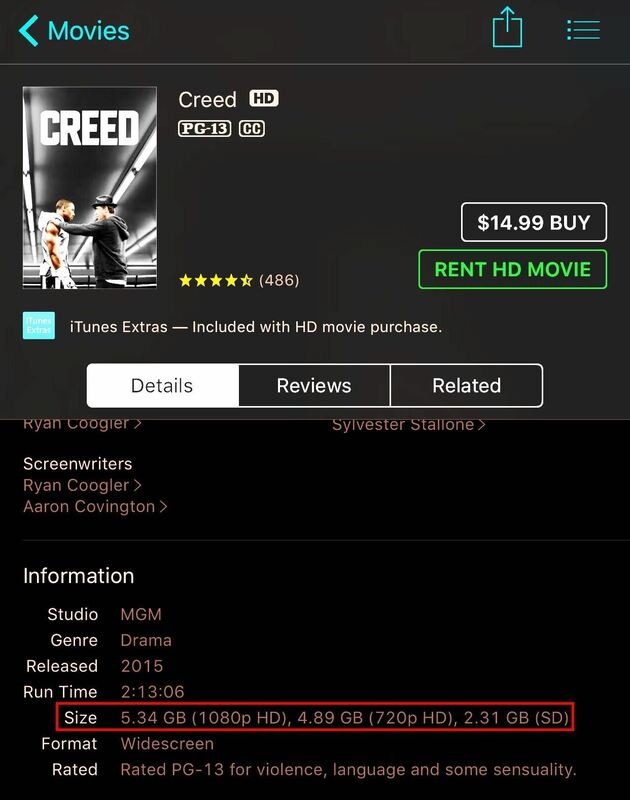 We used Creed for our demonstration, but again, you can use any movie with a file size that exceeds your available storage. Since there's no way of knowing exactly how much space you will open up, you might consider picking a long movie like Gone with the Wind or the extended cut of The Lord of the Rings: The Return of the King. Unfortunately, iTunes doesn't appear to carry Logistics, the longest movie ever made (clocking in at an unimaginable 857 hours). When you click on Rent HD Movie, you'll be greeted with this error message saying that the movie can't be downloaded. Don't worry, you won't be charged anything for this. 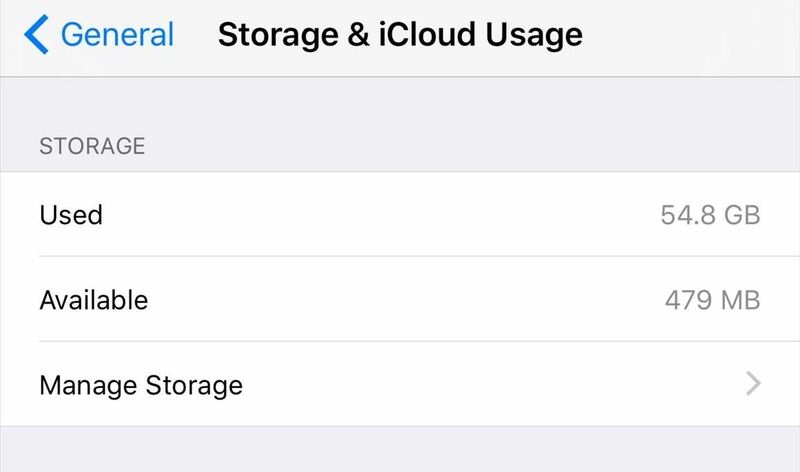 Click on Settings instead of clicking OK, and you'll be taken to the General settings; select Storage & iCloud Usage to see how much space you have. Just like that, we've gained 68 MB of cleared up space. We repeated the process seven more times before it topped out, leaving us with a total of 3.5 GB of available space—3 GB more than we started with. Depending on what kind of apps and files you have on your iPhone, you might have to perform this trick a different number of times—just keep doing it until you aren't clearing out any more space. The storage space will remain available even if you reboot your phone. It's not exactly clear which files are being removed from your phone, but it's most likely the notorious "other" files that can hog your iPhone's storage. You can skip to Step 9 in the link above if you want to see how to remove some of these files manually, and check out the other steps for more storage-freeing tips. Cool, this actually works! I doubled my storage by doings the three times. Ohhh....Is there a similar hack for android users? I had 9.2 GB available before doing what you suggested. Total failure! ?? So, if you had more than enough space on your iOS device to download an HD movie, why would you even try this trick out?! ?